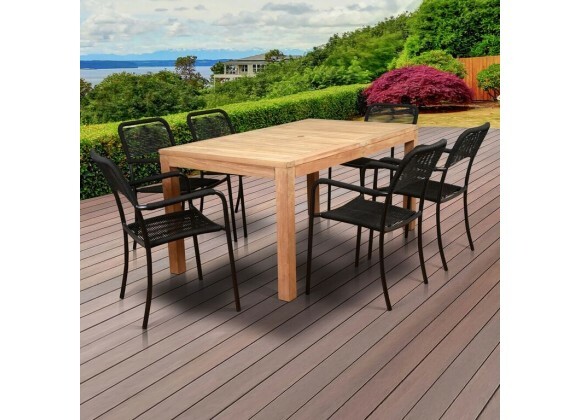 International Home Miami Amazonia Oosterdam 7 Piece Teak Rectangular Patio Dining Set is the perfect match for every patio and will give your backyard the class and elegance for outdoor dining. This set combines luxury, beauty, comfort, and an affordable price. This lightweight aluminium furniture is made from the highest quality alloys and is based on a framework of only new aluminium which maintains the original quality of the material. Aluminium, once coated is 100% rust-free. This chair is made of aluminum and rope. This lightweight aluminium furniture is made from the highest quality alloys and is based on a framework of only new aluminium which maintains the original quality of the material. Aluminium, once coated is 100% rust-free. Chair is coated with Duracoat®, polymer-based, multi-layer powder coating for effective protection from the weather. This contemporary chair set is primarily designed for outdoor purposes but can also be used indoors giving your home a modern touch. Durable and well-designed construction is key components of this great patio set. Table is made of genuine, plantation-grown teak wood (Tectona Grandis) which is wheather resistant and has a natural color and feel. This contemporary set is primarily designed for outdoor purposes but can also be used indoors giving your home a modern touch. Durable and well-designed construction is key components of this great patio set.